We finish just before Midnight Hawaii time. 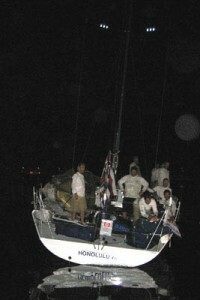 With our brand new Transpac 52 we bettered the record set in 1979 by Merlin, a 70 ft sled! 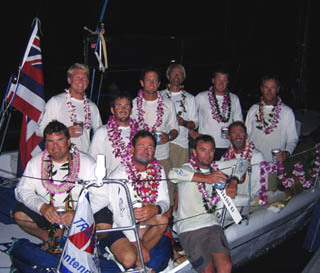 We finished 3 hours and 15 minutes ahead of the next Transpac 52! That was an extraordinary performance with a boat that we hadn’t sailed before, competing with three very experienced boats. We are all smiles here finishing on our 8th night at sea. Being “Unplugged” for 9 days got me to focus on sailing, my friends and partners on the race as well as doing a lot of thinking. The kind of thinking that will help accelerate the success of our new company, Fullpower. Of course as soon as I hit the dock and hugged Sonia and the children, I was instantly back online. A world better connected is a world perfected! This was my 7th Trans-Pacific crossing and the one that was the most fun to date! It only gets better when the boats get smaller and lighter!